I consider myself fortunate that so many 90's albums that I like are being reissued on vinyl for the first time these last few years. The mid 90's were that stretch of time where lots of bands ended up on major labels that you wouldn't expect, and then those major labels never produced vinyl versions. 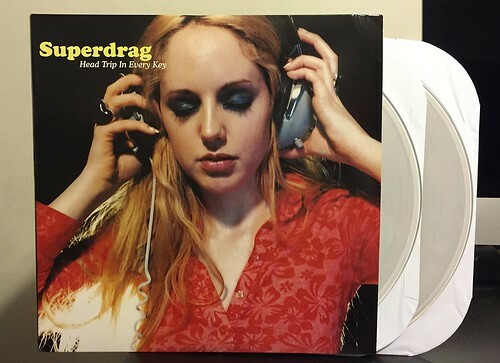 After hearing about how Sony pretty much held the Ultimate Fakebook record hostage from an indie that wanted to release it on vinyl (making that indie attempt a Kickstarter with such a ludicrously high goal; it was never actually going to get funded), it's nice to see that Elektra is playing nice with Side One Dummy so I can have these Superdrag records on vinyl. Though let's be clear, I wont be satisfied until someone releases the Alligator Gun record 100percentfreak on vinyl. It's a crime no one has stepped up to the plate. While I loved Superdrag's debut, Regretfully Yours, I can't say that I really ever spent the same amount of time with Head Trip In Every Key. My buddy Alan really liked it, but for some reason I just never listened to it all that much. Hearing it again all these years later is pretty crazy. It really is a great record. It's definitely not as instantly catchy as regretfully yours, but that's not to say that this record doesn't have its share of hooks. Head Trip In Every Key is a progression forward and a more mature sounding album, but Superdrag never gives up on what brought them to the table; big choruses and great guitar work. The 2 x LP gatefold packaging came out great. Side One Dummy did a really stellar job bringing this record to vinyl for the first time. It's limited, but not ridiculously so. Still, if you have interest in this, you may want to grab it sooner than later. Man, haven't listened to this in ages. Cool to see these being released on vinyl. Go blast Do The Vampire!